A vacant lot next to a factory on 114th Street in the western Havana neighborhood of Marianao has become a six-day-a-week wholesale market where farmers and cooperatives sell fresh produce every night to retail vendors, private restauranteurs, and anyone else willing to buy beans by the quintal instead of the pound. The market started spontaneously in September 2011. The local government gave its blessing six months later, and the whole operation will soon move a few miles south to a government facility that will be organized and run by a new private cooperative. A sign says that the market’s hours are 8:00 p.m. to 8:00 a.m. When I visited a few weeks ago there were 72 trucks parked in formation at 7:00 p.m., and more arriving. 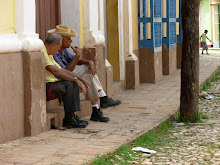 They came from all over – Artemisa, Matanzas, Pinar del Rio, even as far away as Cabaiguan in Sancti Spiritus province. Dozens of fruit and vegetable varieties were on sale, including lots of sweet-smelling pineapples. Black beans that sell in town at retail for 15 pesos per pound were going for nine pesos per pound in hundred-pound bags. Young men make a little money carting customers’ purchases to their cars nearby. All the vendors chip in to pay four guys who clean up the lot in the morning. At the gate, a municipal official notes the content of each truck that comes in, and his rough tally is fed to the office that keeps farm production statistics. As more and more produce is sold on the open market instead of through the old state contracting system, some believe that government statistics are not capturing all private sales and are becoming less accurate. As an economic phenomenon, wholesale sales aren’t new in socialist Cuba. Since 1994, trucked-in wholesale produce, about two thirds of it from private producers, has been the backbone of Cuba’s current farmers markets. They would arrive in cities in the predawn hours to sell to retail vendors, which was not exactly legal since those vendors were supposed to be the farmers themselves or their designated representatives. Only once in memory was that rule enforced, with predictably disastrous results and only for a few days. What is new today is that the state is now supporting private sales as it shrinks the acopio, the web of state enterprises that contracts, buys, transports, warehouses, and distributes food. (A retiree in central Cuba told me, regretfully, that the enterprise where he once worked is being dismantled, with workers being laid off and its trucks being sold to private farm cooperatives.) The government used to buy 85 percent of farmers’ output; that share is now down to about 60 percent, and the goal is to reduce it to about 35 percent. The remaining government network that will serve hospitals, prisons, and schools, with the rest of the food supply moving through private channels. Eventually even the libreta, the household food ration book instituted 50 years ago as a temporary measure, will disappear. The phrase “cutting edge” doesn’t come to mind when we see an open produce market, a common feature of nearly every economy. But this market represents the slow but steady change in Cuba’s farm sector. Under new policies, the government is reducing micro-management of farmers and buying less from them, downsizing its own distribution network, and trusting the market eventually to assume the predominant role in pricing and distributing the island’s food supply. It’s a sign of a new direction that when this Havana market popped up in a vacant lot, the government ignored it, then embraced it and looked for a vacant government facility where a private cooperative would run it, under a roof to shelter everyone from the rain.